N.T.P. Murphy identifies the Coal Hole in The Strand (in A Wodehouse Handbook, Volume One ) as one of four remaining London pubs mentioned in Wodehouse’s writing. It is mentioned in ‘The Debut of Battling Billson’, after long-suffering narrator James Corcoran meets Ukridge at the Gaiety Theatre. Ukridge leads Corky down the steps to the cellar bar and, over a couple of tawny ports, outlines his latest scheme of managing a champion boxer. During a recent visit to London, I followed his example, leading my family down the same steps and through the back entrance, immediately next to the Savoy Theatre stage door. 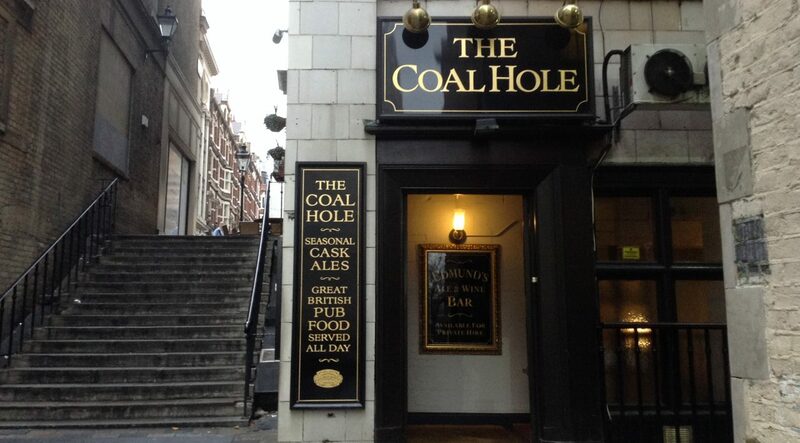 The Coal Hole is in the heart of Wodehouse’s West End. The Savoy Theatre was very much of Wodehouse’s time, opening in October 1881, five days before his birth. It’s owner, theatre impresario and hotelier Richard D’Oyly Carte, was father to Rupert D’Oyly Carte, whom Wodehouse credited as the inspiration for the character of Psmith (the D’Oyly Carte family believe Wodehouse confused Rupert with his brother, Lucas). The Savoy Theatre was home to the Gilbert and Sullivan operas, which the young Wodehouse greatly admired. Wodehouse would later have one of his own plays, Brother Alfred (written with Herbert Westbrook), produced by Lawrence Grossmith at the Savoy in 1913. The Gaiety Theatre (demolished in 1956) was famous for its musical comedies and chorus girls, including the ‘Gaiety Girls’ who shocked society by marrying into wealth and aristocracy. They were also a great source of material for the young Wodehouse, who worked for The Gaiety as a stand-in lyric writer (see Murphy’s Handbook for juicy details). His writing is bursting with actresses (like Cora ‘Corky’ Pirbright), chorus girls (Sue Brown, Billy Dore) and former stage dames who’ve put their past behind them, like Bertie Wooster’s Aunt Julia. There are some things a chappie’s mind absolutely refuses to picture, and Aunt Julia singing ‘Rumpty-tiddley-umpty-ay’ is one of them. Wodehouse’s long association with the theatre is most remembered for his contribution as a Broadway lyricist, working in collaboration with Jerome Kern and Guy Bolton. For an account of his theatrical career, Wodehouse and Bolton’s 1954 memoir Bring on the Girls is terrific fun. There are also references in Wodehouse’s fiction that are clearly drawn from his experiences in the theatre. George Bevan, hero of A Damsel in Distress, is a good example. George blushed. However successful a man may be he can never get used to Fame at close range. Similar sentiments were politely concealed by my long-suffering family, who stood by the entrance to the Coal Hole as I indulged my habit of talking to strangers — on this occasion, a charmingly odd bird, who genially informed us that he hailed from outer space. I ought to have invoked the Ukridge spirit by inviting him to join our party, before touching him for a fiver, or at the very least a glass of port (poor Corky is touched for two rounds of tawny in ‘The Debut of Battling Billson’). Sadly, Ukridge’s big, broad, flexible outlook deserted me at the critical moment. We took the steps down into the quiet, wood panelled cellar bar. It was easy to imagine this cosy haven attracting thirsty theatre goers, cast and crew. Its intimate atmosphere offers patrons the potential for raucous conversation, intimacy or solitude, according to the mood and occasion. A friendly barmaid directed us to explore the main bar on the floor above, with its entrance directly onto the Strand, abaft the Savoy and (presumably) opposite the old Gaiety. The two bars probably attracted different clientele, but Ukridge was a man who mixed in a wide variety of social circles and I wondered at his choice of the cellar over the grander bar. But as a slightly shabby Colonial, Ukridge’s tastes suited me perfectly well. My snifter at the Coal Hole was short, but instructive, and it seems a fitting way to toast the end of another year of writing Plumtopia. I’d like to close this final piece for 2015, by raising a glass of the old tawny to you, readers and friends. Thanks for your support and encouragement. Best wishes to you all for 2016! Super, Honoria. And it certainly makes one long for London and a pint with a pub grub meal. I especially like the lyricist nifty. Plum was at his best being mock-modest. What Ho, Ken, and thanks! I loved the nifty too. Oh, to have been a contemporary of Wodehouse’s and have been able to seen the musical comedies of the day. How about lobbying someone for a revival – surely some impresario’s missing a trick here?? Thank you Honoria for this. I’ll be sure to stop by next time I’m in London. I wish you and your family all the best for 2016 and look forward to another year of most enjoyable dips into Plumtopia. What ho, and thank you, old bean! Politicos elsewhere may be twiddling their thumbs as to how to keep their election pledge of introducing complete prohibition in their just-won territories, residents of Plumsville just can not do without their daily dose of tissue restoratives. Here is a chance to visit one of the watering holes in real.